Fournier brand is a famous poker brand, it is made in Spain and welcomed by Europe poker lovers, people always play for entertaining themselves, we produce Fournier poker vision marked cards to make games more enjoyable. Fournier poker vision cards are like other Fournier cards, they are 100% plastic playing decks with standard poker size, peek dual indexes of large and small. 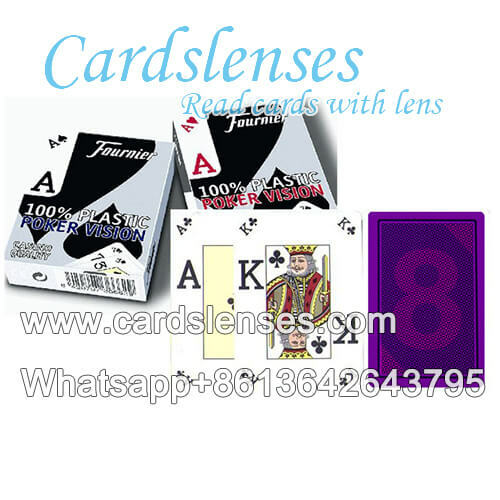 We have red cards in a casino design for sale, the effect of invisible marks on red cards are really good, they are luminous when you see the cards by wearing our infrared contact lenses and sunglasses. Not only can you buy Fournier poker vision marked cards for yourself to enjoy the games, you can also buy for your friends or family as gifts, I believe no one would refuse this attractive and wonderful novelty poker device.